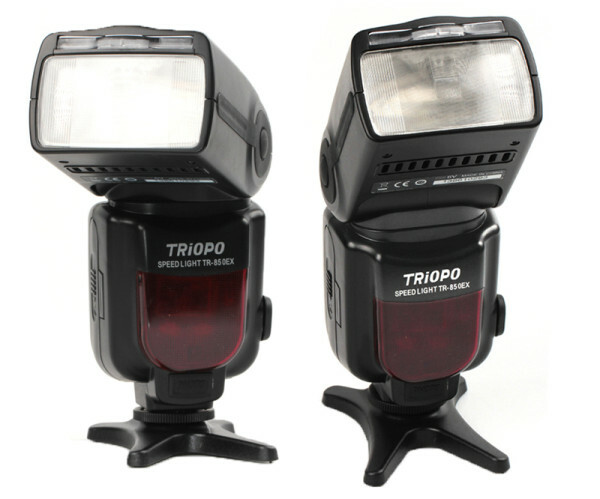 The first flash in Triopo's remotely-adjustable speedlight system is now on sale. A rival to the Canon 600EX-RT? The first potential rival to Canon’s radio-enabled Speedlite 600EX-RT has been released. It’s called the Triopo TR-850EX and has a 2.4GHz radio transceiver inside, allowing remote triggering and power adjustment from other compatible flash units up to 50 metres away. The TR-850EX is one half of Triopo’s radio-controlled flash system unveiled in April. The other is the as-yet-unreleased TR-860EX, which additionally offers wireless E-TTL exposure control and high-speed sync (HSS). In the meantime, the TR-850EX supports manual control, proprietary master and slave modes and stroboscopic (multi) flashing. What’s the appeal? With remote control, photographers can adjust all the flashes in their studio — even those high up on stands or buried in softboxes —without leaving the camera position. With commands transmitted via radio, rather than infrared, the signals can travel further and more reliably than Nikon and Canon’s own optical transmission systems. According to retailers, the TR-850 has a metric guide number (GN) of 56, a three-second recycle time and power control down to 1/128 of full power. The manually zooming flash head can select focal lengths from 24–180mm, swivel 180° left and right and tilt vertically from -7–90°. There is a PC sync port, Nikon-style external battery input and a metal hotshoe foot. Triopo’s ten-channel 2.4GHz wireless control is specified to works over ranges up to 50 metres. Adjustments are made via an LCD control panel on the back of the flash. The built-in optical slave cell (for basic triggering) has a 10–15-metre range outdoors. While Canon’s flagship flashgun is priced perhaps a bit too high to eliminate demand for cheap flash triggers, at just $70 per unit the TR-850EX is actually cheaper than the Yongnuo YN560-III, another radio-enabled flash that only supports basic triggering. On the other hand, there are no low-profile transmitters for Triopo, whereas one can buy a Canon ST-E3-RT or Yongnuo RF-603 for the 600EX-RT and YN560-III, respectively. Other flashguns with built-in radio include the bare-bulb Quantum Qflash and Jinbei MF-100. This newly-released flash is not a rival for the 600EX-RT since it lacks E-TTL and HSS, however the market could see some real disruption when the TR-860EX is released, which will offer both features for Canon and Nikon. Let’s hope it fares better than rival manufacturer Yongnuo’s first attempt in 2010 at a radio-controlled system, the YN460-TX / YN460-RX, which was a market failure. The Triopo TR-850EX is currently available on eBay for US$70 (about £46). You’ll be wanting to buy two so that one can control the other. There is no sign of the products on Amazon or other online retailers yet, nor any indication when the E-TTL-enabled TR-860 variant will be available. What do you think of this system? Would you buy it?